Because you can never have too many diesel SUV options. In the US, the diesel people and the Porsche people haven’t tended to hang out at the same clubs. But diesel engines have been finding their way into more and more non-pickup applications at an almost unheard of rate for this country. 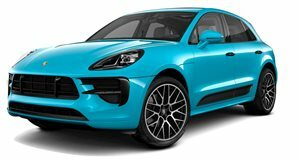 With the Germans largely leading this effort, it actually makes perfect sense that Porsche has now confirmed that the US will get a 245 horsepower turbodiesel V6 option for the long talked about Macan SUV. The oil burner will be positioned towards the cheaper (for a Porsche) end of the Macan’s trim lineup. At “under $60,000,” it will sit neatly between the $50,000 Macan S and the $73,000 Macan Turbo. The 3-liter turbocharged mill is likely the same one found in the Macan’s platform-mate, the Audi Q5. This has been available in diesel form for some time, and has been very well received. So we can expect that the somewhat pricier Porsche version will not disappoint. It’s expected to debut next year at the 2015 Los Angeles Auto Show, and then arrive at dealerships in late 2015 or early 2016.